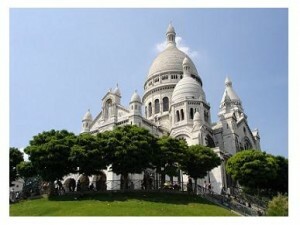 The Basilica of Sacre Coeur is one of Paris most visited monuments and is situated in the districts of Montmartre. This Romano-Byzantine inspired church is really beautiful and recommended if you planning to visit Paris. When the Franco-German War began in 1870 two catholic businessmen made a private religious promise to build a church dedicated to the Sacred Heart of Christ, if Paris was saved by the threatening Prussian invasion. The two men named Alexandre Legentil and Hubert Rohault de Fleury experienced that despite the war, Paris was saved by invasion. They asked permission from the archbishop Guilbert in Paris and he accepted the project. Thus, the building work began in 1875, with construct drawings of the architect Paul Abadie.